During Oland's first trial in 2015, the defence tried to get the emails between Oland and his wife declared inadmissible by claiming spousal privilege, but Justice John Walsh ruled against them. The defence also initially objected to the email exchanges being entered as evidence at the retrial, but later agreed with the Crown that Justice Terrence Morrison was bound by the Court of Appeal upholding Walsh's ruling. Crown lawyers allege financial desperation created a motive for murder. They speculate Dennis Oland made some kind of a pitch for help when he visited his father July 6 and the meeting did not go well. In a decision on the pre-retrial issue, Morrison wrote: "Even if I am not bound by the Court of Appeal decision ... I have no hesitation in coming to the same conclusion as Justice Walsh...I agree entirely with his reasons and his ultimate decision." Emails admissible. Johnson reading emails between Dennis Oland and his wife in early June 2011 where both are hunting for money to pay a bill but both are over their limits on their credit cards. Emails on June 1, 2011 indicate Oland and his wife Lisa were trying to figure out how to work around their maxed-out $27 ,000-limit Visa. Doesn’t give a true sense of a person’s financial position unless you do a balance sheet, correct? asks Lacy. Johnson agrees. Lacy puts list of all Oland's $1 ,666.67 interest payments to his father up on a monitor in the courtroom. Shows cheque on July 5/11 (day before his father was killed) bounced due to insufficient funds. But Lacy points out the next cheque on July 19/11 cheque went through. You weren't asked to look beyond July 7/11 in this analysis? No. You previously testified about the "peaks and valleys" of his account Jan-July 7/11 as income was coming in and expenses being paid? Yes. Same held true for entire month of July? Yes. In fact, July was slightly better than April, May and June - ended with positive balance of $572 .68? asks Lacy. Johnson agrees. Defence had Johnson do similar review of Oland's finances for 2009 and 2010. Lacy tells Justice Morrison he's going to go through it fairly quickly but will take direction from the court. Morrison says, "I’m following it at a high level, but don’t quiz me on the numbers." You found spending vs. income Jan. 1-July 7/11 had deficiency of about $86K ? asks Lacy. Johnson agrees. Deficiency for same period in 2010 was about $40K worse? $128 ,659.58? Yes. Lacy says he intends to finish questioning Johnson today, doesn't want him to have to come back tomorrow, but asks for a short recess to review. You want 5 min? asks judge. Can I have 7? asks Lacy, prompting some chuckles. 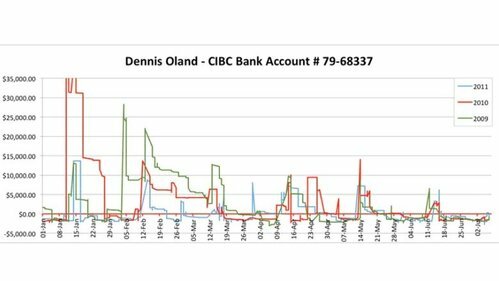 In 2011 Dennis Oland was earning less than $7 ,000 /mth at his job. His spousal/child support was $4 ,233 /mth and payments to Richard Oland were $1 ,666. Lots more money going out than coming in every month. Redirect by Crown prosecutor Derek Weaver. How did Oland's debt load in 2009 compare to 2011? It was increasing as time passed, says Johnson. Dennis Oland retrial wraps up for the day. Scheduled to resume at 9:30 a.m.